Did New Era give Hat Club the wrong caps to sell? EDIT: We have an explanation. @SamuelYLam @NewEraCap This was just how our batch of hats were created originally before they switched them back to the traditional side. Check out the photo of Yasiel Puig. He’s wearing the cap that his teammates are to wear during their weekend opening series in Australia against the Arizona Diamondbacks. Notice that the patch is on the left side of the cap. The D-Backs’ caps will also have that patch on the left side. But for some odd reason, New Era didn’t manufacture all of the caps like that. You can see that on MLB Shop, they are selling them as you see in the above photo. Even Lids has it right. But with distributor Hat Club, their caps are different. Patch on the wrong side? The caps from Hat Club feature the patch on the right side of the cap. You can see the Dodgers and the Diamondbacks versions. These are actual photos of the cap, not some stock image with a photoshop job. Even consumers are realizing this. How could they have made this mistake? As per the description of these caps, these are what the players are supposed to wear. 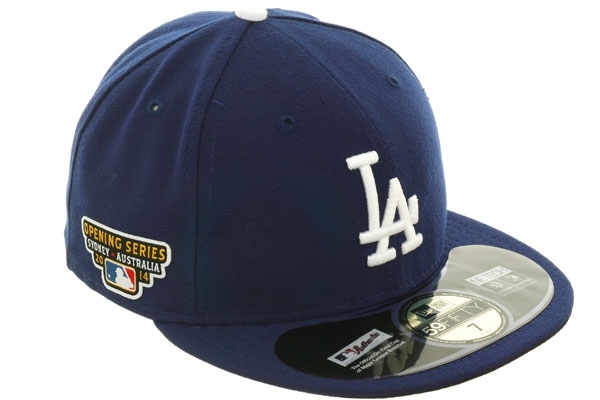 Special edition Sydney, Australia Opening Series patch on the side are the hats the players are supposed to wear on the field when the Arizona Diamondbacks and Los Angeles Dodgers open the 2014 MLB season in Sydney, Australia. So how did this error happen? Does this devalue the cap or since it’s a rare find, it increases its value? This entry was posted in Arizona Diamondbacks, Los Angeles Dodgers, MLB, New Sets, Uniforms & Design and tagged New Era, Opening Day, Patches, Sydney Australia. Bookmark the permalink.